Some old furniture keeps it’s character and style throughout the years. Others, not so much! Maybe you have some furniture that was passed down to you that isn’t your style. Or, you could have purchased some necessary pieces at a thrift store. 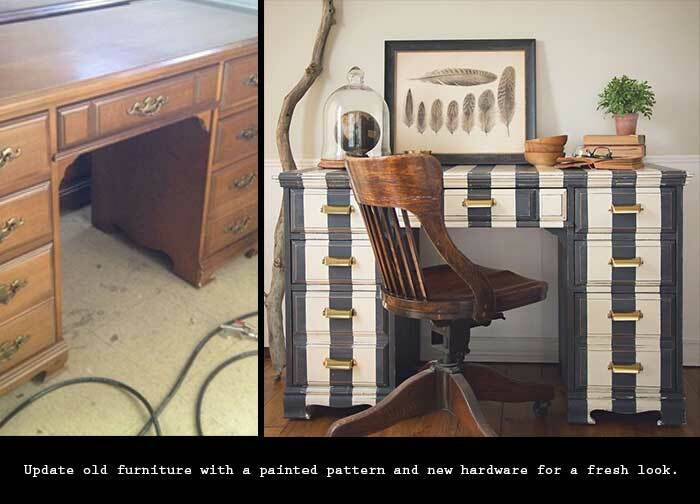 Regardless of how you acquired your vintage pieces, I will show you how to update old furniture for a new modern look. There are plenty of ways to give your old furniture a fresh new look. Most of them are easy to do and don’t cost a lot of money. The best part of making over furniture yourself is the ability to customize. For this reason, it may be worthwhile to visit a thrift store or two. Maybe you can find a piece with good bones and give it a custom look. This is usually less money than purchasing a brand new piece of furniture. Probably the easiest way to get a new look is simply with paint. Whether you paint a solid color or a fun pattern, the look will be fresh and customized to your needs. This painted desk hardly looks like the same piece of furniture. By just adding paint and new hardware the desk gets a fresh modern look. Because the desk is painted in stripes, the finished look is even more stylish. I also love the pairing of the vintage chair as a contrast to the fresh paint. The look is very rustic chic or modern farmhouse. A solid color paint also works to give a fresh new look. 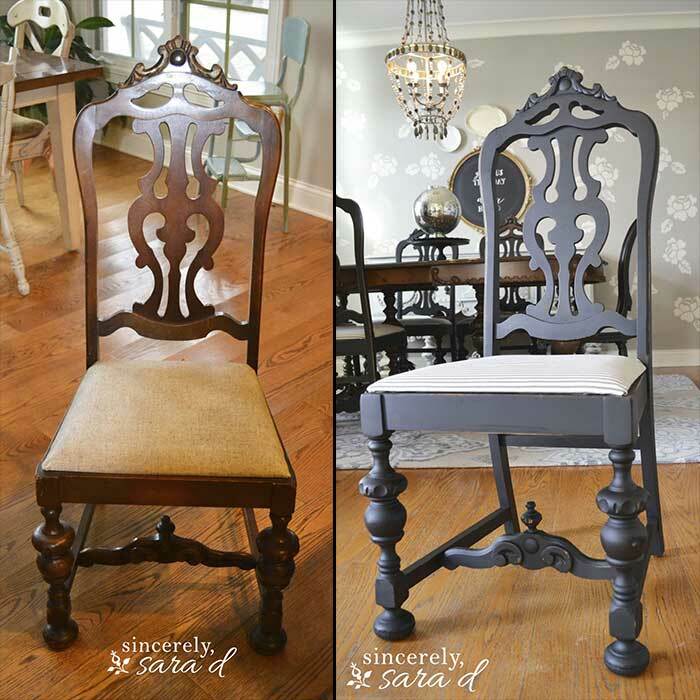 This chair makeover updates the style with both paint and new fabric. Since fabric can also make a huge change in furniture style, it is great to use on chairs, sofas and even a coffee table! If you like to kick your feet up onto your coffee table, you might want to make it a little more comfortable! 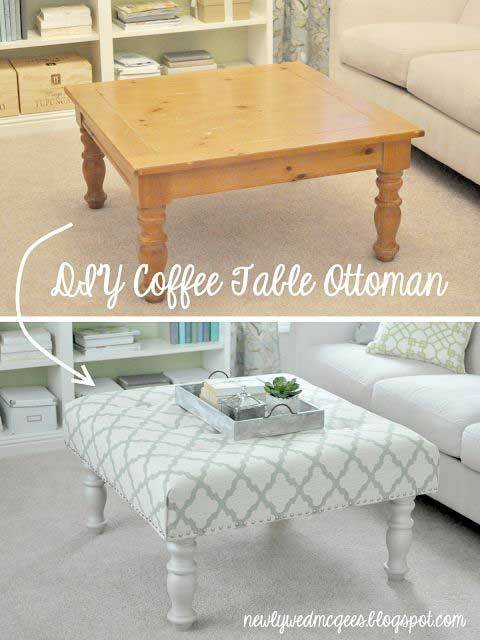 This coffee table turned ottoman is a fairly easy project with a whole lot of impact. To give dressers or cabinets an instant new look, try changing out the hardware. This is an easy fix that can update your look. Changing the hardware, adding paint, and installing new feet will make even a better update! 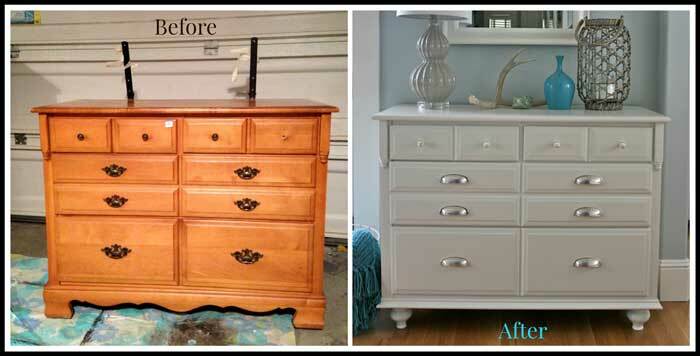 This dresser makeover looks like a brand new piece with the more modern touches. Another fun way to update old furniture is to give it style with stencils or image transfers. Stencils add a lot of interest to a piece of furniture. This stenciled end table looks so much better than it’s former self! This next idea for updating old furniture is a little more crafty. You can quickly change a style with simple paper and mod podge. This technique is also a good way to use up some of your leftover wrapping paper. 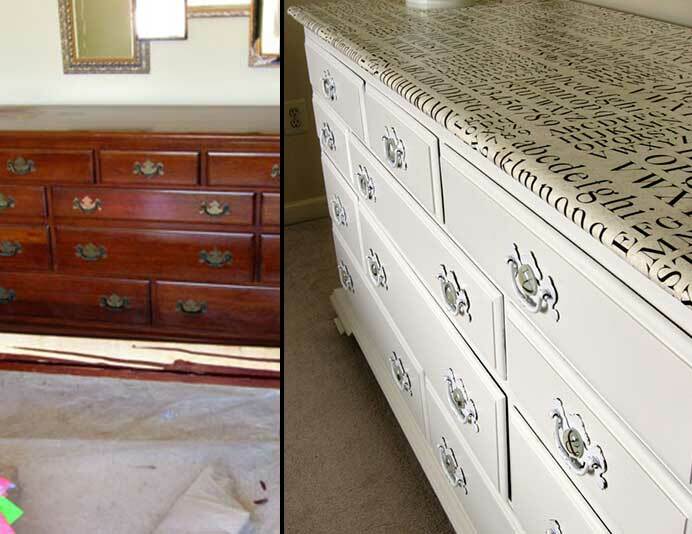 Here is an example of updating an old dresser with wrapping paper. You can also use newspaper, wallpaper, or any type of paper that you have on hand.